Posted On December 21, 2014 by Team iCynosure. I'm a woman and more importantly a mother, who is always on the lookout of safe and secure means to survive this environment. With every surface you touch, every inch you see and even the air you breathe infected with germs and bacteria, you need a weapon of destruction against these enemies. Off everything available in the market from creams to sprays to disinfections, my go-to products are wet wipes. I especially like to use wet wipes as they do their job while adding moisture to the skin and leaving it supple and tender. There are numerous brands available in the market and one such new entrant is Dettol. A pioneer in germ protection and safeguarding health through hygiene since 1933, Dettol has become a household name in India and all over the world. With Dettol’s entry in the multi-use wipes range, it shall definitely change the dynamics of the sector. 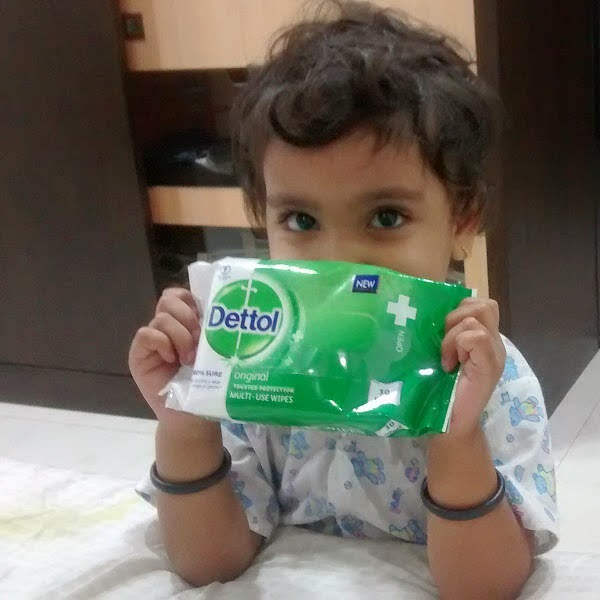 What is the Dettol Multi-Use Wipes all about? The Dettol Multi-Use wipes provides protection from germs for your skin and surfaces, at home and on the go. Being pH neutral, the wipes do not interfere with your skin’s natural protection while the emollients moisturize your skin. Ingredients include Aqua, Propylene Glycol, Phenoxyethanol, Polysorbate 20, Disodium Lauroamphodiacetate, Disodium Phosphate, Citric Acid, Benzalkonium Chloride, Parfum, Tetrasodium EDTA, Lodopropynyl Butylcarbamate, Methylchloroisothiazolinone and Methylisothiazolinone. How is Dettol Multi-Use Wipes packed and priced? Packed in a pull-out green and white pouch, it attracts instant attention with the trademark Dettol sword. The packing is extremely smart and cheerful in two variants. A 30-tissue and a 10-tissue packaging priced at INR 115 and INR 45 respectively with a shelf life of 24 months. When I heard about the product and was sent a review product, my expectations were very high because of the Dettol lineage and brand value. Since the product can be used on skin and surfaces alike, I was pretty impressed and have used it sparingly over the last two weeks. Not only did I love the cleansing effect but I also like the fact that it leaves the skin supple and moisturised as well. After personally using it for a week, and being satisfied with it I let my little one use it as well. With the product being pH neutral and alcohol free, I am rest assured that it shall not affect the skin’s natural protection levels. While travelling it is my constant companion for all my cleanliness needs, be it cleaning my little one’s face, to cleaning my hands from time-to-time to even disinfecting an area or toy that my little one is going to use. With the formulation specifically suited for a baby’s skin, this is a one in all product to be put in the handbag. Will I repurchase / reuse the product again? Definitely! Will I recommend the product to friends? Sure, Yes! Even though it is a bit expensive, the product finds a permanent place in my handbag only due to multi-functionality. To know more about Dettol Multi-Use Wipes and to give the product a try, get your pack here. Do you think Dettol is synonyms with health and hygiene?